Rather than defining happiness, the poet Jane Kenyon prefers to describe its coming in her poem of the same name. And, I might add, it comes to the egret and heron alike, to the bank-lining reeds, and to the watcher in the fog. It may even come to the fog, unless, of course, it comes as the fog itself. Happiness is as individual as people who feel it. Beautiful poem. That’s true, GP. And there’s often no predicting when, or how, it will arrive: just as Kenyon makes clear in her poem. What a lovely poem and image. Thank you for both, Linda. You’re welcome, Gary. I was going to use your “special word” as the title for this one, but decided to hold on to it for a bit. It’s so great, it deserves just the right image. Its the fog! I love this Linda. You have captured happiness here. I certainly was happy to see the birds appear. I’d left home in bright sunshine, but the farther west I traveled, the heavier the fog became. When I no longer could see the sides of the road, I pulled over next to this little backwater connected to the bayou. Eventually, the fog began to lift, and I discovered there were breakfasting birds out and about. I do enjoy a good foggy adventure! This is exquisite, Linda. A perfect pairing of image and words and especially timely. Thank you. Under normal circumstances, this isn’t the prettiest spot in the world, but the combination of early morning light and fog transformed it. When the birds appeared, I thought to myself, “Well, isn’t this a happy turn of events?” and that reminded me of Kenyon’s poem. I’m happy you enjoyed the pairing. A little respite in the midst of the day’s concerns never is a bad thing. Like fog, depression can dull the colors of the world and muffle its sounds: one reason that I changed the title of this post and added the poem. The lifting of the fog seemed to me like Kenyon’s depiction of the coming of happiness. I met her work through her poem “Let Evening Come”. It’s simplicity and directness are quite powerful. I always feel surprised a bit, when someone refers to fog as spooky, ghostly, or melancholy. I love the fog, especially an early morning misty day, and even mundane scenes can become beautiful. Well, your lovely foggy picture and good poem have sent some happiness my way, thanks Linda! I’m a fog lover, myself. When I lived in Berkeley, one of my favorite things to do was to go up to the top of the Berkeley Hills and watch the fog coming in, over, and around the Golden Gate Bridge. Ground fog here isn’t nearly so active or interesting, although our sea fog can be delightful. But there are days when being in the right place at the right time can offer some lovely sights — like these birds in a bayou backwater. I’m glad to have added a bit of happiness to your day, Rob. I’ve heard about the fog in San Francisco Bay, it’s always sounded cool. We mostly just get ground mist, in the little creek valleys, not real pea-soupers. I think your kind of fog would be easier to photograph. The contrast between the fog and the visible hills and valleys makes things more interesting. Linda, I once wandered down to the Refuge on a December afternoon and was caught by a late fog blowing in… The images I captured then “haunt” me still. Those are absolutely wonderful images. It’s interesting how the fog can take on such different characteristics. “December” and “blowing in” suggest it was a sea fog — probably my favorite of all the fogs we get. Even the white birds look good in fog, as your photos show. I did see something a week earlier I’ve never seen before: coots in flight. For years I’ve watched them appear in the fall, and disappear in spring, and of course they had to be flying at some point to accomplish the migration. But I’d never seen it. I thought I was photographing geese until I came home and put the photos on the computer. Tucked into the middle of the geese were these rotund little black birds with stubby wings, short feet, and white faces — when I realized they were coots, I couldn’t have been more delighted. I’d heard they fly only at night, because they’re so bad at it, and I saw them about 8 in the morning. I was trying to get down there much earlier on the day I took this photo, to see if I could find them again, but the fog put an end to that. You finished that thought just the way I thought you would. I have such affection for coots. I’ve still seen only a few at the refuge, and just three or four in the marinas, but they’re clearly on their way. After this week, I’m sure there will be even more. Just think Linda, that’s how we “met” first. It was your post on the Weather Underground about our Christmas Miracle that introduced me to your writing. And, it’s my picture of Christmas morning that we still hang above the mantle for the festive season to prove, even to ourselves, that miracles do still happen and even on the Texas Gulf Coast you can have a White Christmas..
That’s right. I remember your comment on that post so long ago. I re-read it yesterday when I heard about the snow possibility, and very well may repost it. Even if I don’t, it was fun to remember the experience. When I was commenting about the Christmas Snow I went to my photoblog looking for the image and discovered I’d never reposted it after the sight died… So I just did.. I used the main image as a christmas card for years. Wonderful! I hope your Christmas Season this year is equally beautiful. I like the quietness and misty atmosphere of a fog.There is not much foggy weather in my little niche of central Texas but the further south one goes there is early morning fog. I really like this lovely pic of the great egret. Fog does provide a nice atmosphere, doesn’t it? We’ve been a little short on it this year; it’s only been in the past two weeks that we’ve seen significant morning fog. With the forecast for cooler weather, we may be moving into the sea fog season, and that makes me even happier. I can’t varnish in these ground fogs that leave everything soaking wet, but I can work around a blowing sea fog if I have to. Later this day, the fog lifted and the sun came out, and I got some really nice closeups of the egrets and a great blue heron that was taking a bath. I’d never seen that, and it was quite a sight. He’ll show up eventually. Will look forward to seeing the great blue taking a bath. I bet the shots are fantastic. Here you go — it may not be the best, but it’ll do. Oh, the bathing great blue is so cute. The ruffled feathers are interesting as it is bathing, as opposed to a sleek body that is so neat and very clean when the heron is wading in the marsh or where ever. I love the eye expression, if one can say a bird has expressive eyes and or face. I’ve always thought birds have expressive faces. Of course, I suppose we read some of our own meaning into those expressions, but on the other hand, there’s no question that I’ve seen birds irritated, or sleepy, or frightened. It’s great fun to catch them in moments like this. Every time I go to the refuge, I see something I’ve never seen before. I was so hoping somebody would post a photo of the fog, Linda — thank you! I know it’s treacherous to drive in, but I do enjoy looking at it from afar. Kenyon’s poem speaks well to the elusiveness of happiness. I’ve long believed that being happy comes from within, not without, though of course circumstances have a way of affecting our moods. We’d like to believe that everyone has a chance at happiness … eventually. On my way to the wildlife refuge, the fog became so thick there was zero visibility. The two lane road I was traveling is a prime route for fishermen pulling boats, and it just seemed better to pull over and wait it out. I was glad I did. Otherwise, I wouldn’t have gotten this photo. Happiness certainly can be elusive. There isn’t any formula, and there certainly isn’t any program we can follow to find it. As you say, it comes from within; some of the happiest (or most content) people I’ve known have been so despite some challenging circumstances. And it can be a choice, too — I’ve known a few people who seem determined beyond all reason to be unhappy. They often succeed. Yes, and sadly they often take down others with them! The fog gives such an ethereal beauty to the image. Wonderful poem, too! Happiness is abound, but we don’t always realise it is there, see it or feel it for we sometimes get swamped and buried in our hectic lives. ‘Time’ is so very precious, but so is ‘Pause’ :) They should go hand in hand. I’d never thought about the “pause” button as a metaphor for temporarily disengaging from our frantic activity, but it’s a good one. It is easy to become swamped, as you say, by all of the concerns of daily life, and an occasional stepping back may in the end lead to a more healthy reordering or our priorities. I’m glad you like the poem. Kenyon’s not as well known as some of our poets, but I’ve always found her work accessible and engaging. This poem seemed just the right match for the image. And it never seems to come when you go out looking for it. Your comment made me smile, Terry. The opposite’s true, too. When I left home on the morning I took this photo, the skies were blue and the sun was shining. Then, I drove through a little ground fog. As I went farther west, it became thicker, until it finally hit pretty darned close to zero visibility. I pulled over to wait it out, and as it began to lift, I saw the birds. Sometimes, things work out. Give me fog anytime. A bright blue sky, stark with the relentless sun seems to create a poetry bypass. Love the photo of the keen eyed birds watching for a frog or so. I bet they don’t worry about happiness. Isn’t it interesting how the weather, the seasons, and the natural world in general can affect our moods and productivity? I was talking with someone last week about life in northern California. When I first moved there, the gorgeous skies and perfect temperatures day after day were a delight. Eventually, I started grumping a bit, asking, “Don’t you people ever get a thunderstorm? Or maybe even some clouds?” Eventually, the fog showed up, and that was good. Your comment about the birds’ lack of worry reminded me of a favorite verse, and the film that took from it for a title: “Consider the lilies of the field, how they grow; they toil not, neither do they spin; yet even Solomon in all his glory was not arrayed as one of these.” I’ll bet the flowers don’t worry, either. You think the frogs have a problem? You should have seen the blue crab community I ran into. The first sign of them were the remains of the crabs that didn’t hide quite well enough — along with some raccoon prints. This actually is the first fog photo I’ve taken I’ve liked. The location, with the birds, reeds, and grasses helped a lot. Like you, I find it peaceful, but I was glad I wasn’t on a schedule that morning and could wait for it to lift. The only thing that’s worse than driving in fog is being on the water in fog. From your time on the coast, I’m sure you know that both sight and sound can be significantly skewed. If the nasty surprise turns out to be a fully loaded cargo ship –well. I don’t think there’s been a year in the past twenty-five that there hasn’t been at least one collision in the Houston Ship Channel in foggy conditions. Most cause minimal damage, but “minimal” is open to interpretation. I found that even baby alligators in Florida are considered tasty by Great Blue Herons. You want to avoid mom, however. Be ever vigilant. Happiness is a ninja that can strike at any moment. That’s a perspective that sounds completely “you.” Now I’m thinking of Sandburg’s fog-cat as a ninja. Well, yes indeed. Happiness as the returning ‘prodigal’–such an apt metaphor. I rather like fog, though the meteorological kind is not something I experience all that often. Lovely post. Isn’t that ‘prodigal’ image something? I thought she expanded it beautifully, without being heavy-handed. As for fog, I suspect there’s none up your way this morning. I’ve been tracking the cold front, and it may be only a few hours until we change from foggy, dewy, and wet to blustery, dry, and cold, with a thirty degree drop in high temperatures between today and tomorrow. Calm and placid has its place, but there’s something exciting about winter frontal passages. I suspect you have a lot of birds sheltering in your garden. Wonderful poem! And your photo and thoughts compliment it well. (Seeing the heron & egret in an early morning fog would certainly make me smile!). You know how I’ve envied some of your misty and foggy shots — that PNW aura just can’t be beat. Most of the time, we get ground fog that’s like a smothering wet blanket, but now and then we’ll get blowing sea fog. That can be pretty dramatic, if you’re in the right place and not huddle inside because it’s cold. It tickled me that they were going in different directions, and seemed to be oblivious to one another. I don’t know if I’ve just never noticed it, or if it’s different this year, but the various species — egrets, herons, ibis, and smaller wading birds — have been roosting and feeding together. Maybe they’ve all signed non-competition agreements. Oooh, the last leg of my drive to Mindo was at night in the fog, so there wasn’t a blanket of happiness surrounding me – more like 100 percent attention to staying safe! Your image reminded me of that, though the mention of Bastrop snapped me out of the fog memory and transported me into Bayou Country! That great egret looks huge! I’ve seen some really big egrets this year. I’ve also seen a lot of blue crabs. I think they’re eating well. I like the egret in the background too, it’s a very nice moody image with lots to see specially if you click on it to see it bigger. The poem is great with lots to ponder on. I drove by this very spot last Sunday, and I couldn’t find it. For one thing, the water level rises and falls depending on factors I haven’t fully figured out; I suspect that the system of canals threaded through the refuge plays a role, as water is moved around from one area to another. But beyond that, fog can make a quite pedestrian spot seem ethereal and beautiful — as I think happened here. I’m glad you like the poem. I have two or three more of hers tucked away, and enjoy them regularly, so they’ll probably show up here eventually. Ja! I just looked at the recent post and looked at the ‘previous’ post and thought it said, ‘happiness in a frog.’ i was expecting to see an image of a frog with sticky toes on a window! not! it allowed me to admire that great egret again! I have exactly three frogs in my files: one green tree frog, one algae-covered something, and the eyes and legs of a frog-in-a-bog who wasn’t willing to come hither. I have heard a lot of frogs jumping into the water, but I’m going to have to learn some new stalking techniques if I ever want a photo. 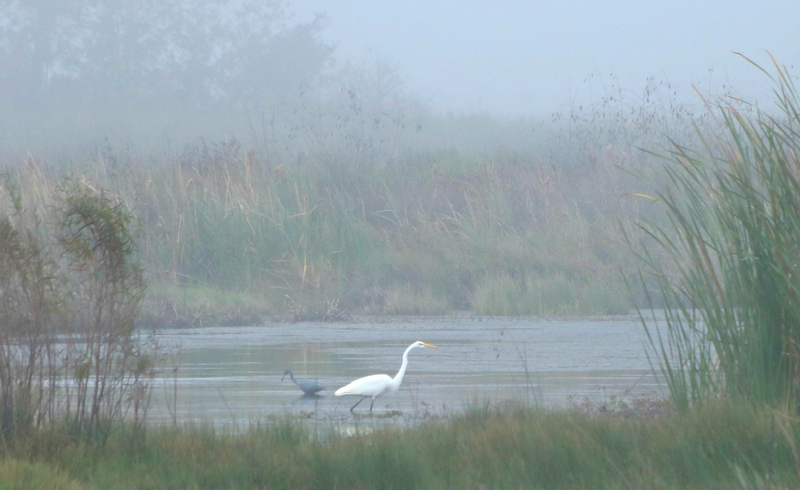 Normally I wouldn’t find happiness in a fog but the egret and the heron make me smile. They are so absorbed in their own pathways, yet so at ease in the presence of each other. And indeed there is no accounting for happiness. I suspect that little slough looks rather different this morning. They received far more snow down that way, and it’s probably still lingering. Here, I’ve already seen some blue sky, and nearly all the snow is gone. It makes me happy I made the effort to get up so early.